PISS CLEAR IS NOW A BOOK! 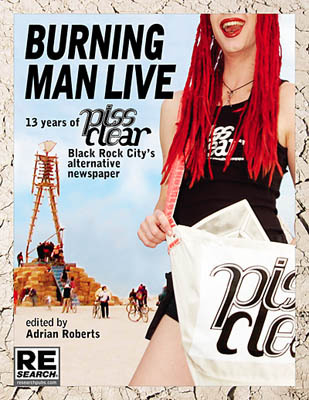 RE/Search Publications has published Burning Man Live: 13 Years of Piss Clear, Black Rock City’s alternative newspaper, a 320-page anthology compiling all 34 issues of PISS CLEAR. It includes a brand-new essay from longtime columnist Malderor, as well as an introduction from Brian Doherty, author of This Is Burning Man. There are also yearly chapter introductions from Adrian Roberts. Telling it like it was, this is the alternative – and yes, opinionated – history of Burning Man. WHAT THE F**K IS "PISS CLEAR"? From 1995 to 2007, the alternative newspaper PISS CLEAR was a fixture at Nevada's annual Burning Man arts festival, its cheeky name deriving from the Black Rock Desert's #1 survival tip: "drink enough water so that you piss clear." For 13 years, editor and publisher Adrian Roberts and his staff of writers wrote about the colorful culture of Black Rock City, and their snarky and sarcastic tone gave PISS CLEAR its well-earned reputation as the "Vice magazine of the playa." Having started off as a sort-of sassy survival guide, PISS CLEAR quickly evolved into Burning Man's snarky reality check, chock full of hard-hitting articles, acerbic rants, witty commentaries, and funny lists. Along the way, it ended up documenting – as it was happening – the growing evolution of the Burning Man event. Yes, it's true! Adrian, Malderor, ShutterSlut, and a crack team of playa journos returned to annual playa publishing in 2010 with the BRC WEEKLY, the successor to PISS CLEAR. After all, every major American city needs its independent alternative newsweekly, and Black Rock City is no exception. 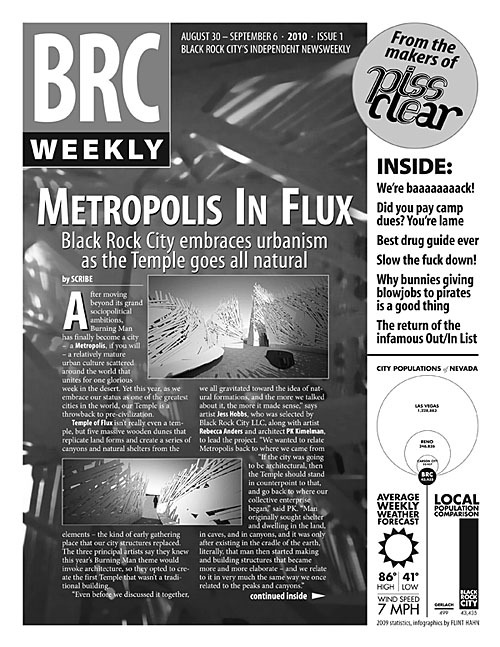 The BRC WEEKLY is crafted in the "Piss Clear" tradition, providing the citizens of BRC a lively, entertaining read for their trips to the porta-potty. Here, you will find a gallery of covers, plenty of fake ads, and HTML archives of most PISS CLEAR articles from 1995 - 2003. None of the articles from 2004 - 2007 are available as HTML files. If you're web-savvy and would like to help us update this archive – please contact us! Otherwise, just buy the book! We hope you have enjoyed our unique perspective on Burning Man ... and we'll still see you out on the playa!